Tookie the Toucan was conscripted to the pet trade. His last owner, however, wanted this bird to live as close to nature as possible, so we have taken him to Laguna de Apoyo Nature Reserve. He is a male Keel-billed Toucan (Ramphastos sulfuratus), and his natural habitat includes the forests behind Estacion Biologica. Although these toucans are among the most attractive animals in Nicaragua, they have a delicate disposition and strict dietary requirements. 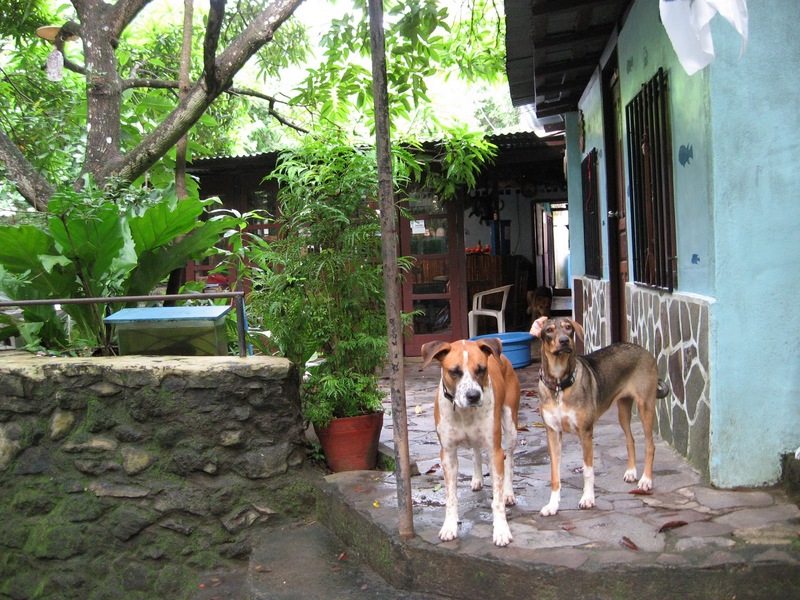 Furthermore, they count among the endangered wildlife of Nicaragua. 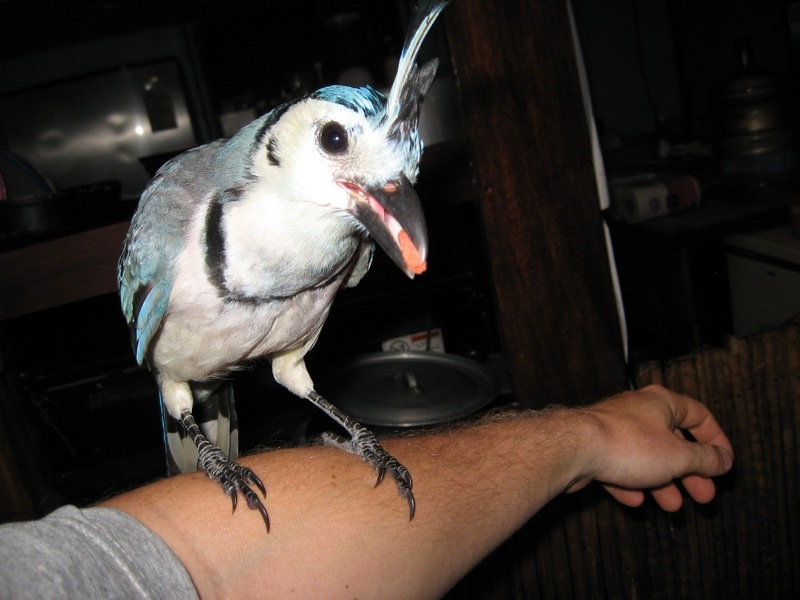 It is against the law in Nicaragua to capture or trade this animal. We are dedicated to keeping Tookie as close to nature as possible-the species is native to our area-and we are evaluating the possibility of releasing him to the wild. We think wild animals should not be put in cages to humor human beings. We can learn to appreciate them in the forests by birdwatching instead of placing them in cages. 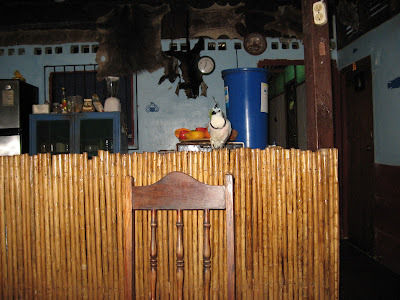 Toucans are not adapted to be pets as are dogs, so living in a cage is appropriate. 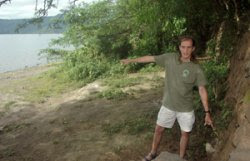 We would like to release Tookie and make him part of the wildlife of the Laguna de Apoyo Nature Reserve. Tookie is getting fed papayas and bananas, along with native fruits from the forest, and a supplement designed for the toucans. Keel-billed Toucans are part of the native wildlife of this area, and we often see them, particularly on the western side of the lake. Three years ago, a nesting pair of Keel-billed Toucans nested just outside Estacion Biologica, near the north shore, but generally, this bird is not found in the northern part of Laguna de Apoyo Nature Reserve. We are gauging his willingness to eat native, wild fruits, with the intention to release him if feasible. Would you like to help us take care of Tookie? Please contact us if you would like to volunteer or make a donation to help us care for him. Although the Keel-billed Toucan is beautiful, it can be very aggressive and does not tame easily. This species is native to the forests of Nicaragua. Photo by Jeffrey McCrary. Tookie enjoys papaya! Photo by Jeffrey McCrary. The sounds of nearby wild birds enchant Tookie. The Keel-billed Toucan bill serves him well to make him a fearsome predator. Photo by Jeffrey McCrary. 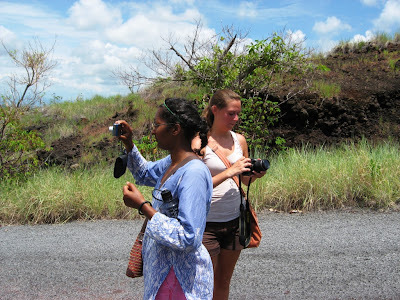 Aura and Rachel admire Tookie in the first moments after his arrival to Laguna de Apoyo. Photo by Jeffrey McCrary. Our research intern, Rachel, befriends Tookie, who enjoys taking food from his hand. Photo by Jeffrey McCrary. Any nature-loving tourist in Nicaragua must visit Volcano Masaya National Park. 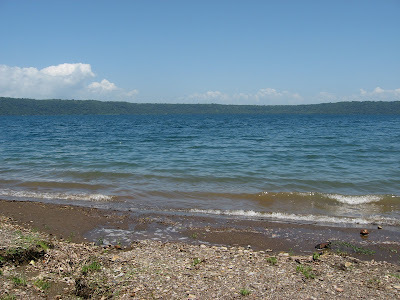 It lies west and north of Masaya, practically adjacent to the Laguna de Apoyo Nature Reserve. Lava flows over two hundred years old still have not been overtaken by vegetation. The process of ecological succession can be noted according to the ages of the earth surface layer. Photo by Henyrk Madsen. 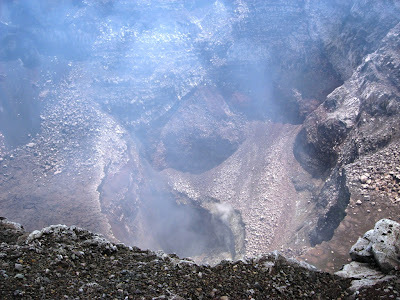 The Masaya volcano is composed of three craters. One of them erupted twice during the past five hundred years of recorded history. 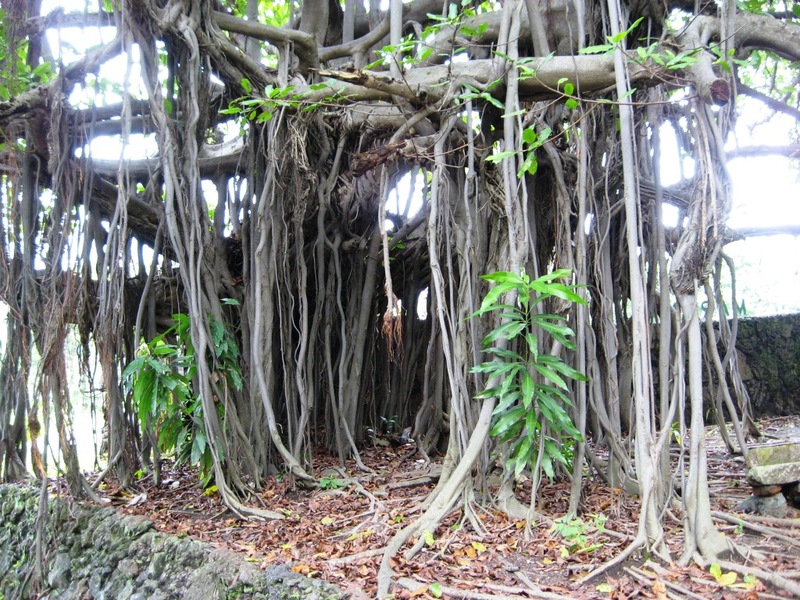 Lava flows are stark, with only islands of vegetation, mostly grasses which burn every few years during the dry season. Two lava flows-one of which destroyed Nindiri-have occurred since the Europeans arrived in the area, and they both cross the main access road to the craters. 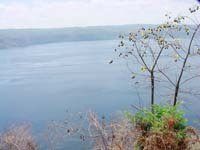 Lake Masaya, seen in the distance, lies inside the caldera of Volcano Masaya, which is several kilometers wide. Our staff at Estacion Biologica is conducting a study of potentially new fish species in the lake. Photo by Henryk Madsen. 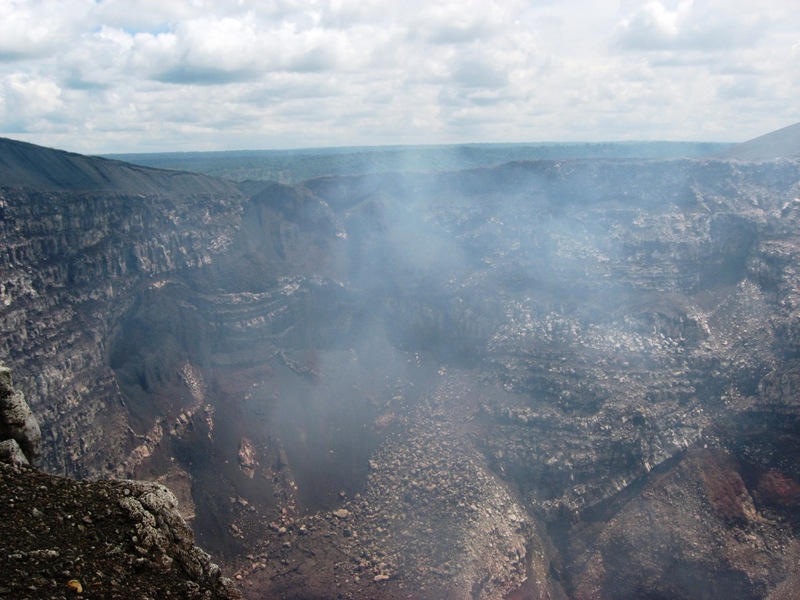 One of the larger well-protected patches of tropical dry forest in Nicaragua lies in the Masaya volcano caldera. Soils over the volcanic scree are thin and water drains from them easily. so that in some areas, where grasses take hold, trees may not be able to withstand the periodic fires which burn through the vegetation. Laguna Masaya and the Masaya Volcano, as seen from Coyotepe. Photo by Hans Rademaker. 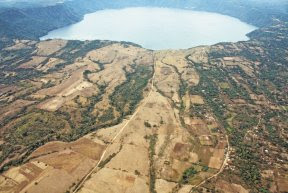 At the foot of the Masaya volcano is Lake Masaya, which from a distance is beautiful, but it is contaminated from municipal runoff from the city of Masaya. Several species of fish inhabit the lake, including likely undescribed species. A couple of alligators are found there, having escaped from a private zoo nearby. The fish of this lake are the subject of a continuing study conducted by Gaia scientists. Two volunteers at Estacion Biologica, Helen and Simone, prepare their cameras for some spectacular views. Photo by Henryk Madsen. 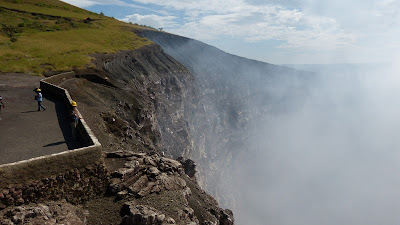 The Santiago crater emits large quantities of smoke. The glow of red-hot lava is usually visible during the night tour of the volcano. Photo by Henryk Madsen. 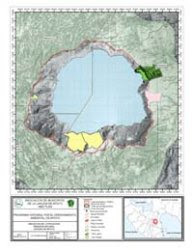 The three craters of the Masaya volcano complex are all different. The earthtones are very rich in the volcanic atmosphere, with purple, white, red and brown seen, One of the craters holds a forest in the crater which is impenetrably deep. 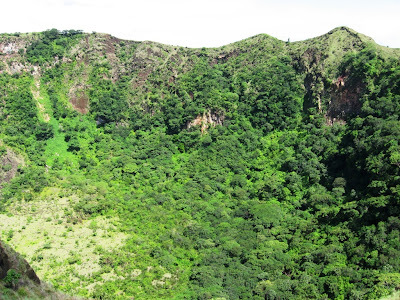 Along the steep banks of this crater, parakeets nest. How they survive the acrid smoke is not understood. Photo by Henryk Madsen. 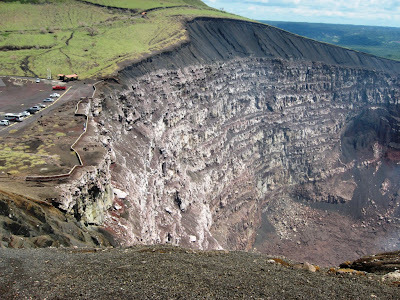 The stark Santiago crater of Volcano Masaya presents a variety of colors. Photo by Henryk Madsen. 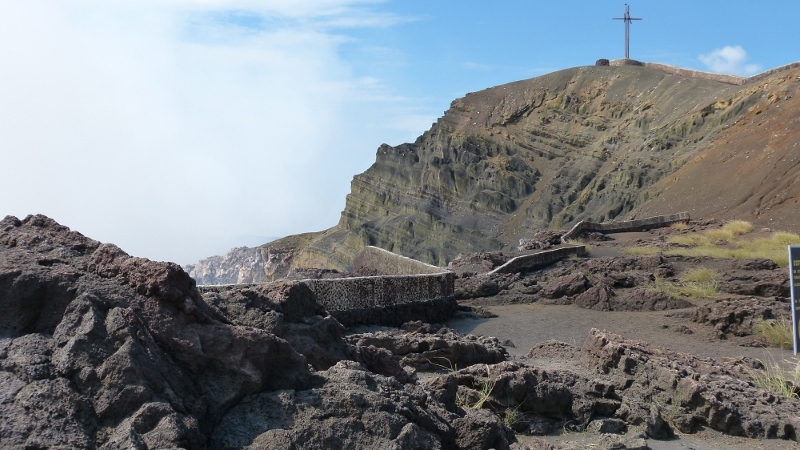 A cross was placed on the edge of the crater because the first Spanish colonists considered the Masaya Volcano to be the mouth into hell. Photo by Hans Rademaker. 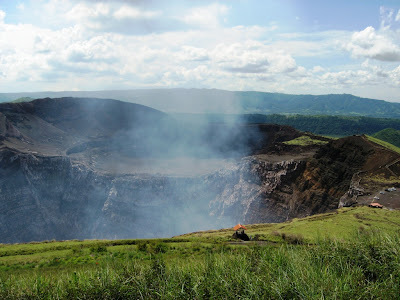 Volcano Masaya is very active, with lots of smoke emanating from one of its craters. Photo by Hans Rademaker. 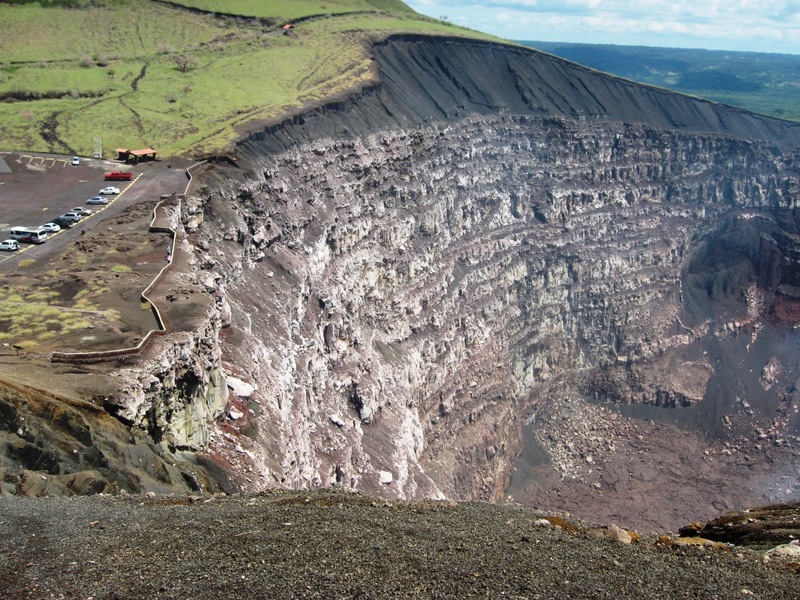 The interior walls of the Masaya Volcano show dramatic colors. Photo by Hans Rademaker. 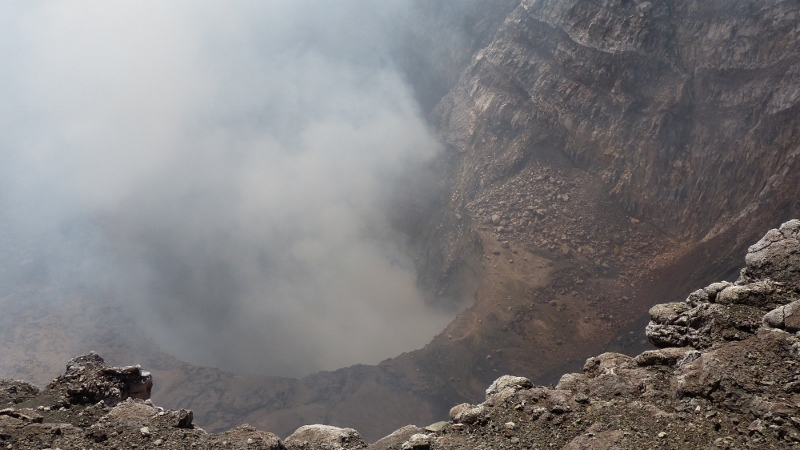 The interior of the Santiago crater is stark, due to large quantities of acrid smoke. Photo by Hans Rademaker. 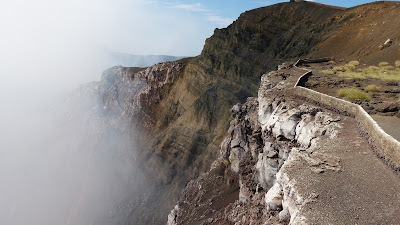 Visitors can approach the Santiago crater easily. Photo by Hans Rademaker. 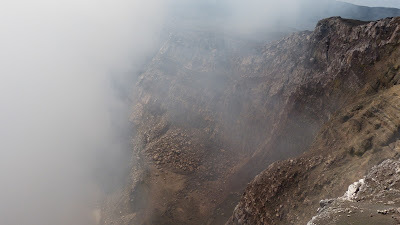 A lava tunnel at the bottom of the Santiago crater can be seen through dense smoke. Photo by Hans Rademaker. 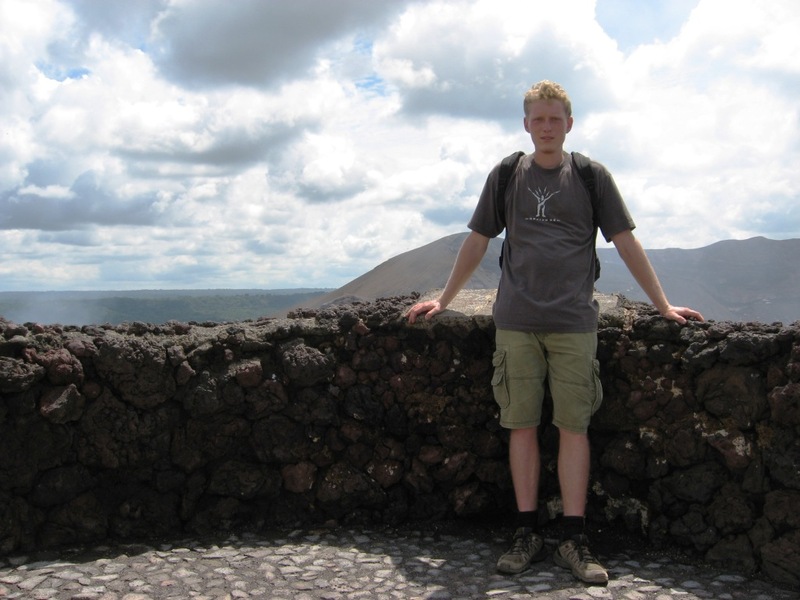 The eastern edge of the Santiago crater is tourist-friendly, given the prevailing westward winds in Nicaragua. Photo by Henryk Madsen. Skinks are among the commonly seen fauna in the dry tropical forest habitats of Volcano Masaya National Park. Photo by Henryk Madsen. 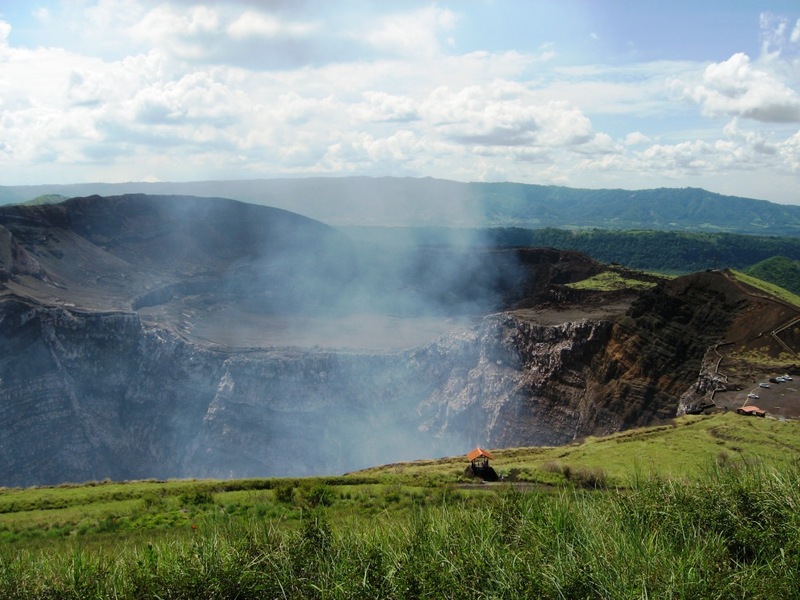 The stark differences between the different parts of the Volcano Masaya National Park-lake, tropical dry forest, lava flows, caves, and three very different volcanic craters-make an excellent ecotour. 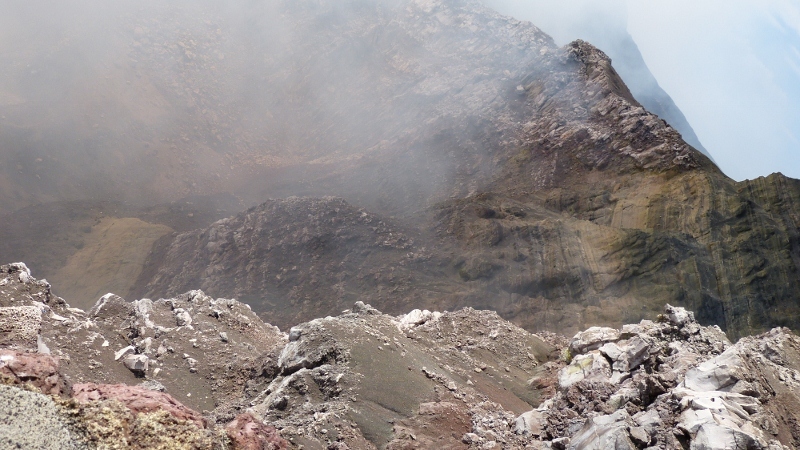 The San Fernando crater contains a remote forest beneath steep crater walls. Photo by Henryk Madsen. Hiking trails at the top of the craters provide great views both of the craters and the park, and also of Managua, the Great Lakes, and Masaya. Night visits to the park are possible, in which visitors penetrate a cave, as the bats are departing for their evening activities. Smoke emanates from the Santiago crater at Volcano Masaya National Park, Nicaragua. Photo by Henryk Masden. This strangling fig (Ficus sp.) near the entrance of the park awaits your visit. Photo by Henryk Madsen. 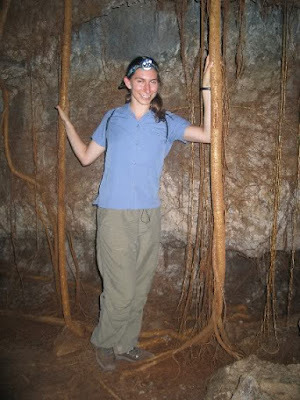 An evening excursion to Volcano Masaya includes a lava tunnel visit. Photo by Tammy Cameron. 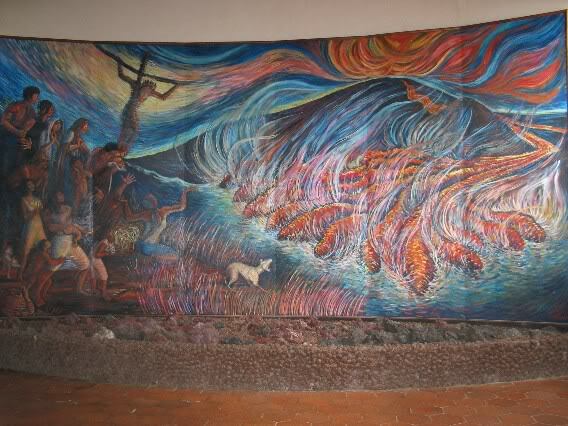 A mural in the interpretive center depicts the confrontation of religions with the lava-filled crater. Photo by Tammy Cameron. For a day trip, plan about three hours while there for a day trip, and spend at least one-half hour in the interpretive center. Take sunscreen, a hat, and something to drink. Welcome to our humble place, Estacion Biologica near the shore of Laguna de Apoyo. 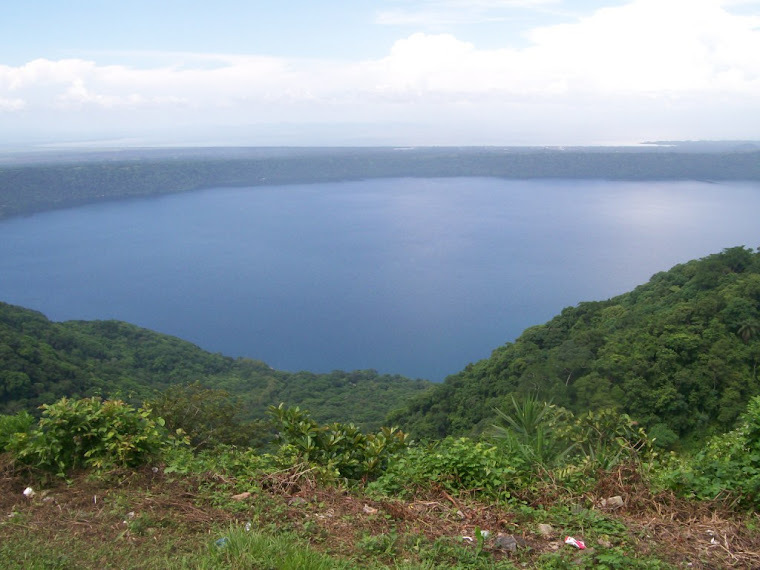 We work with volunteers, researchers, the local community, the civil society and government to advocate the protection of Laguna de Apoyo Nature Reserve. We provide lodging, birdwatching tours, SCUBA diving, lunch, and Spanish language instruction to individuals and groups. Volunteers from Goshen College painted this mural during their study abroad semester. Photo by Jeffrey McCrary. 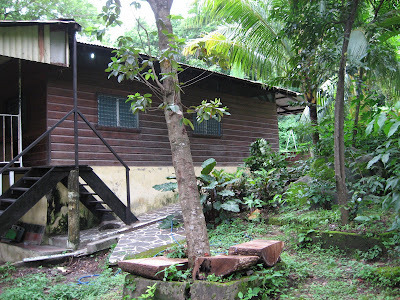 Estacion Biologica is operated by the Nicaraguan Foundation for Integral Community Development (FUNDECI). We are a not-for-profit organization registered by the Nicaraguan government since 1973. 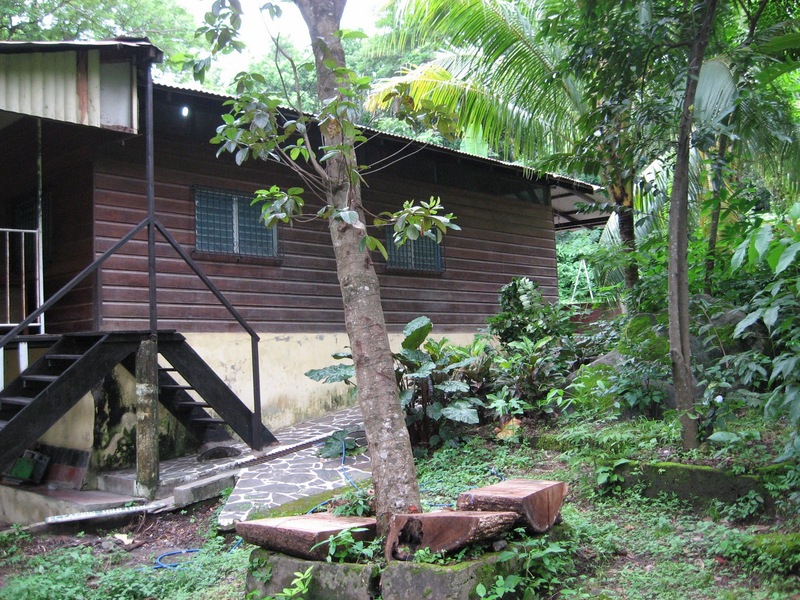 The first project of FUNDECI, construction of a small settlement on the edge of Leon, benefitted displaced people from the devastating 1972 Managua earthquake. 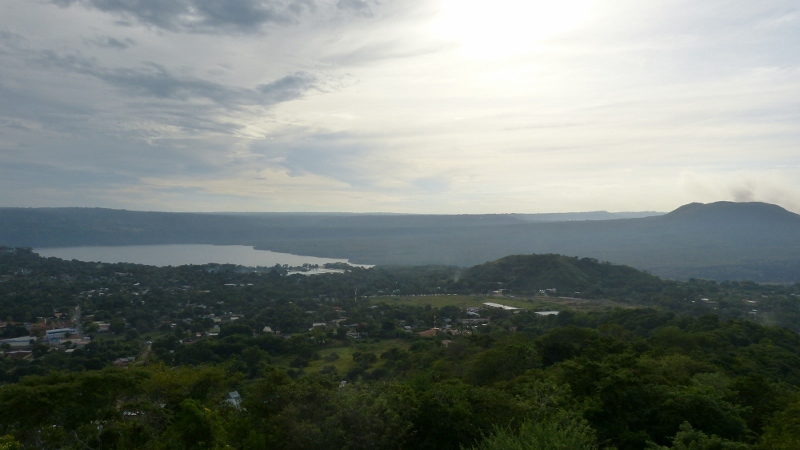 FUNDECI works throughout Nicaragua today, with principal projects in Santa Teresa, Leon, Matagalpa, Managua, and our project in Laguna de Apoyo, which is divided among seven municipalities. Our mascot, Heinz, is a rescue animal. He is a White-throated Magpie-Jay. He enjoys our kitchen and dining area, and often comes back to visit with us. Photo by Henryk Madsen. The facilities at Estacion Biologica are found in a set of properties along the shore of the crater lake, Laguna de Apoyo. All the houses we occupy were built before the area was officially designated a Protected Area by the Nicaraguan government. 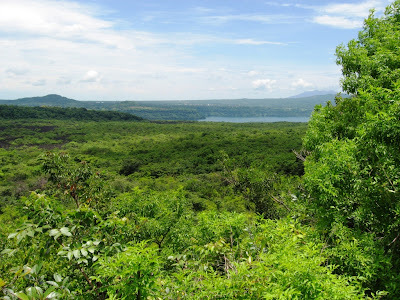 There is great conflict in Laguna de Apoyo Nature Reserve regarding the rights of landowners, particularly non-Nicaraguans, who want to clear their land of wilderness and place a house on it. Of all the many threats to this protected area, this one is the greatest. 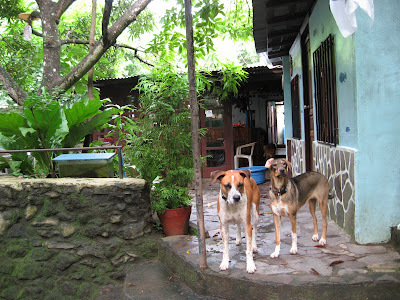 Simba and Bela serve as our welcoming committee for new arrivals to Estacion Biologica. Photo by Henryk Madsen. 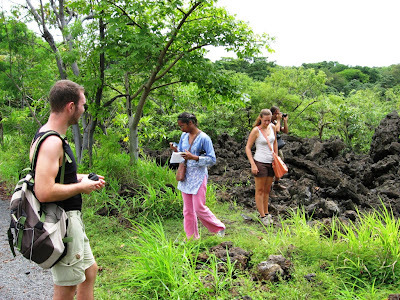 Inside Nicaragua, our group is well-known as the premier research team on biodiversity issues. Our group has published dozens of scientific research reports on several taxonomic groups. We have discovered several species of fish in the lake. Our team worked extensively on the first official management plan to be approved for the area, and we provide logistical assistance to the park rangers and police whenever they request it. The facilities at Estacion Biologica are integrated into the environment. Photo by Henryk Madsen. We have lodging for individuals or groups of up to twenty people. We serve breakfast, lunch and dinner daily, and great coffee is always on hand. If you are looking for a hostel for overnight stay in Laguna de Apoyo, we have a room waiting for you, near the water where you can swim day or night. You don't have to be a volunteer or scientist to visit us, any consciencious tourist is welcome! 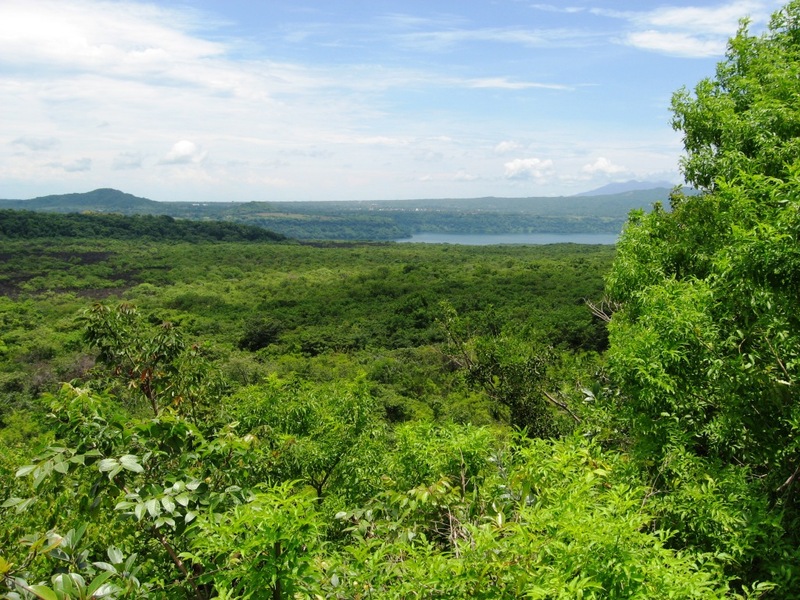 A view of the forest in Laguna de Apoyo Nature Reserve. Photo by Henryk Madsen. 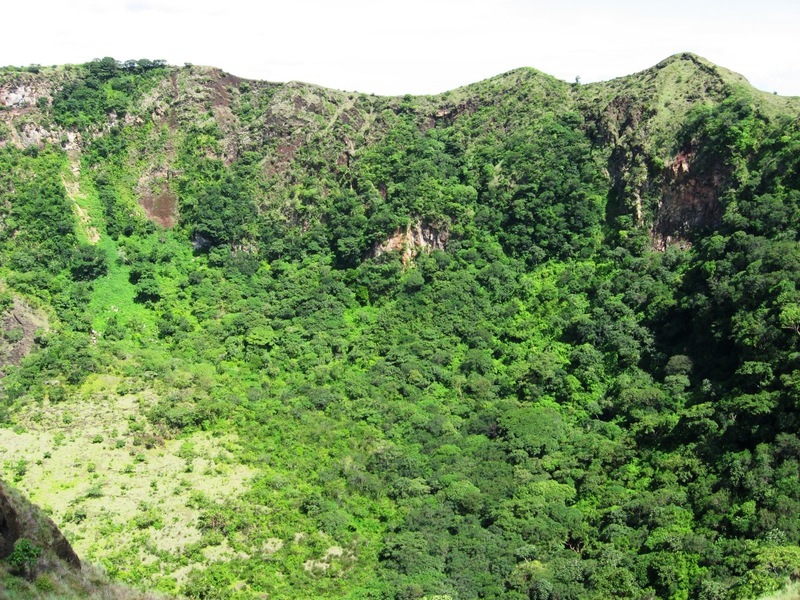 Inside the volcanic crater, there is tropical dry forest, in which rain is concentrated during the months May to November, and the remaining months have almost no rain. Trees and wildlife must have strategies for their water needs during the dry season. Lake Apoyo, Nicaragua. Photo by Henryk Madsen. The lake spans four kilometers and reaches nearly two hundred meters deep. Animals in the lake are isolated from other aquatic habitats, and several species of fish (members of the Midas cichlid species complex in the genus Amphilophus) have evolved during the existence of the lake. It's a great place for humans to swim, too. 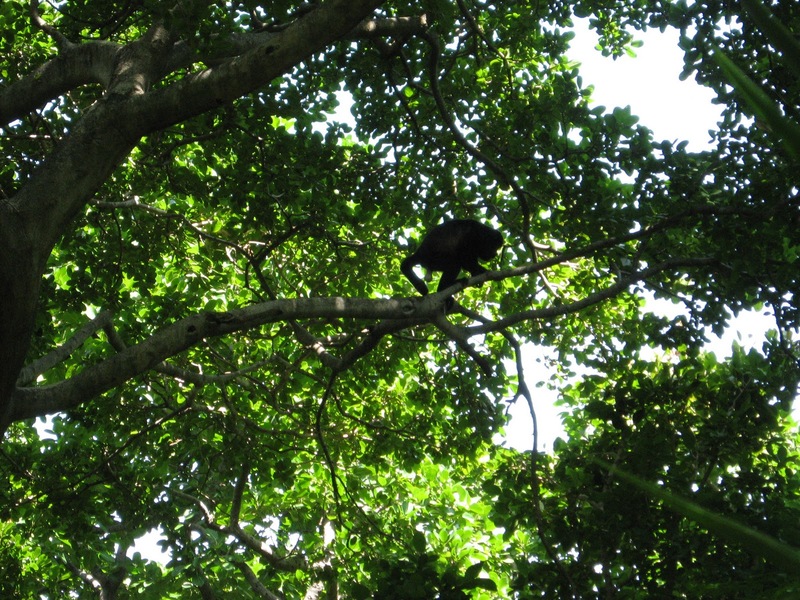 A howler monkey travels through the yard at Estacion Biologica. Wildlife is abundant in the area. Among the more common mammal sightings are howler monkeys and variegated squirrels. Both can be seen in the yard most days. Also to be seen for the keen eye: paca, agouti, jaguarundi, grison, capuchin monkeys, white-tailed deer, nine-banded armadillo, Virginia opossum, Central American woolly opossum, and numerous bats and smaller rodents. Dragon fruit is called pitahaya in Nicaragua, where it is native. 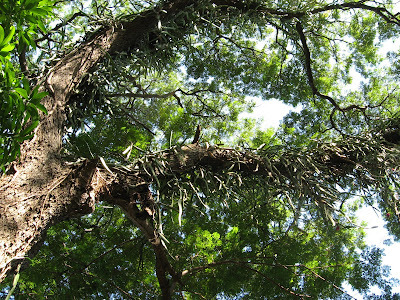 The pitahaya plant is an epiphytic cactus, living on rocks and branches of trees. 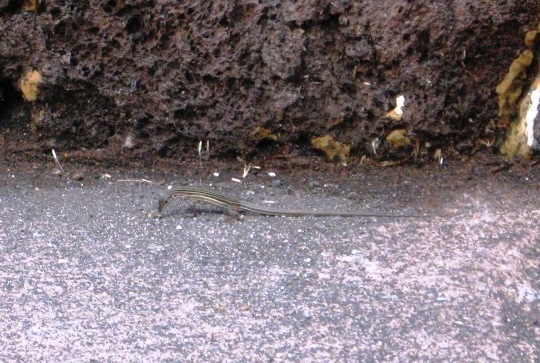 This one is in the yard of Estacion Biologica. Photo by Henryk Madsen. The towering trees of the forest extend into the yard of Estacion Biologica. 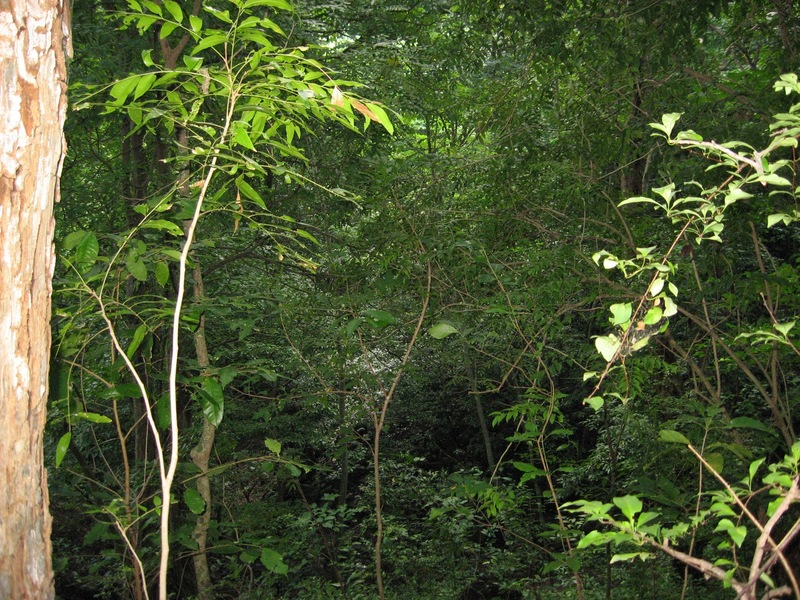 Our property enjoys the shade of about twenty tree species native to the forest of our Reserve. We grow and plant native trees in the deforested areas of the reserve, and we encourage the appreciation of native trees among land owners and the government. Among our work is rescuing wild animals in need of intervention. This bird was one of our rescue animals. He now lives in the forest, but returns to visit us often. Photo by Henryk Madsen. 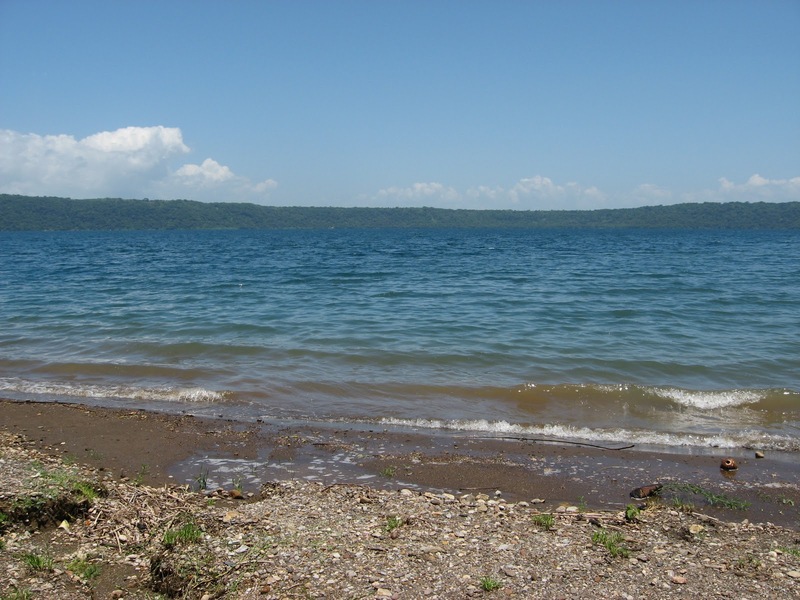 We at Estacion Biologica work closely with the Ministry of Natural Resources and the Environment, the municipal governments, and the National Police to keep Laguna de Apoyo Nature Reserve wild and natural, and its community prosperous. We work with volunteers, so you might want to join us and volunteer. Volunteers from Estacion Biologica enjoying a visit to Masaya. Photo by Henryk Madsen. Please visit us! We look forward to meeting you and discussing what we do. Here are a few more great reasons to go birdwatching at Laguna de Apoyo Nature Reserve, with thanks to Romain de Jaegere. This set of photos is of the more common birds, which you are almost sure to see in a few hours of birdwatching. Under appropriate lighting, the male Canivet´s Emerald (Chlorostilbon canivetii) seems to glow. Its nest is a cup measuring no more than about four centimeters across, often placed not even one meter above the ground. This is the smallest of the ten hummingbirds recorded in Laguna de Apoyo Nature Reserve, and it is relatively easy to identify. Hummingbirds eat very small flying insects and spiders, and drink nectar. 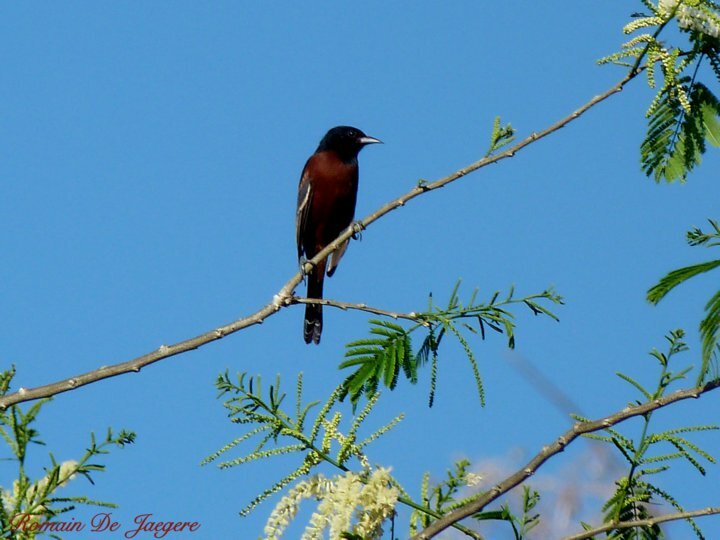 The Orchard Oriole (Icterus spurius) is a migratory species, present in Laguna de Apoyo Nature Reserve from October through May. It will be near trees with juicy fruits and flowers with nectar, in the canopy of trees or actively feeding on flowers, although it will take insects as well. 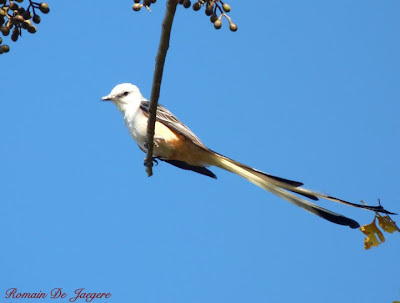 Another migratory bird commonly seen in Laguna de Apoyo Nature Reserve is the Scissor-tailed Flycatcher (Tyrannus forficatus). Like most flycatchers, they can be seen making forays to catch insects on the wing. In the late afternoon, large flocks amass and move toward roosting areas, allowing views of dozens at a time. Although insectivorous, they may be seen pecking at fruit with the dry season is at its peak. 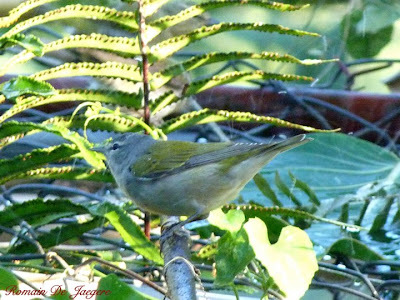 Migrant warblers and vireos fill the forest canopy with chipping sounds, but most of them are migratory. Nonetheless, the forest is not empty when they have moved northward. 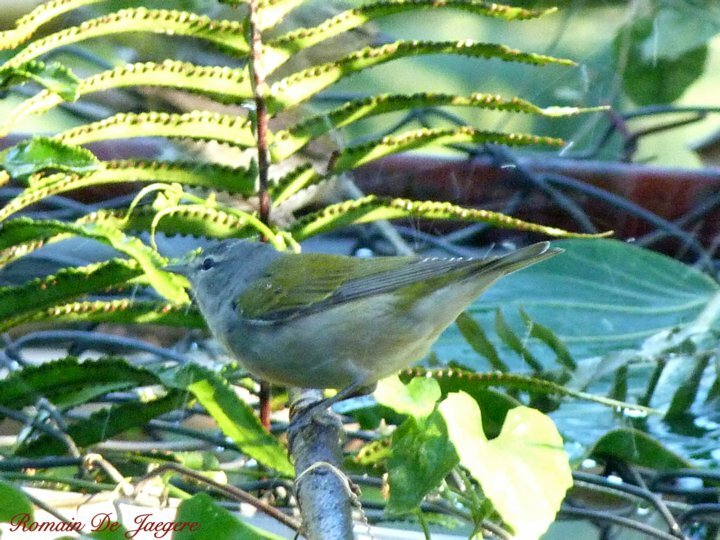 The Lesser Greenlet (Hylophylus decurtatus) is resident here in Laguna de Apoyo Nature Reserve, but commonly forms loose feeding flocks with migratory insectivorous birds, Summer Tanagers and other warblers and vireos. 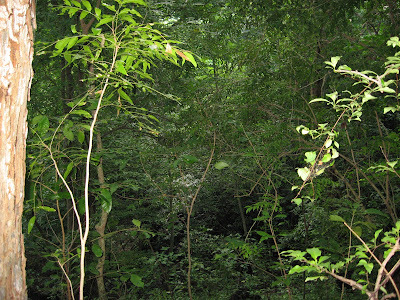 It tends to stay at midlevels under forest canopy. While not uncommon, it is less conspicuous than most insectivorous birds and is easily missed. 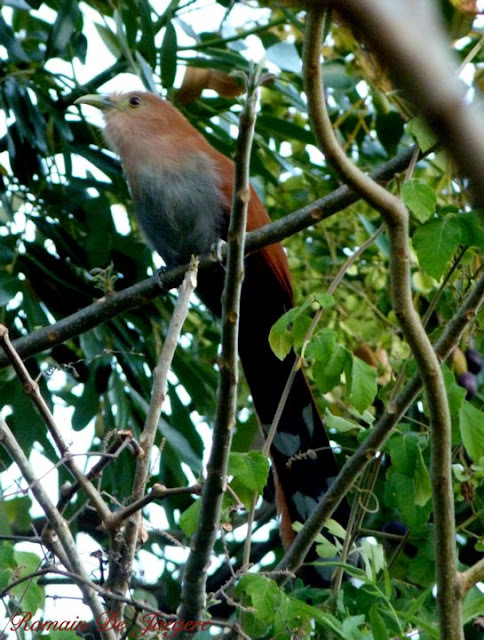 The squirrel cuckoo (Piana cayana) lurks in midlevel vegetation, and hops from branch to branch with movements that suggest a squirrel, from which it gets its name. This resident bird is common in Laguna de Apoyo Nature Reserve and ranges throughout the tropical and subtropical habitats from Mexico to Argentina. Although many other cuckoos are brood parasites, this species builds its own nest and provides parental care to its offspring. 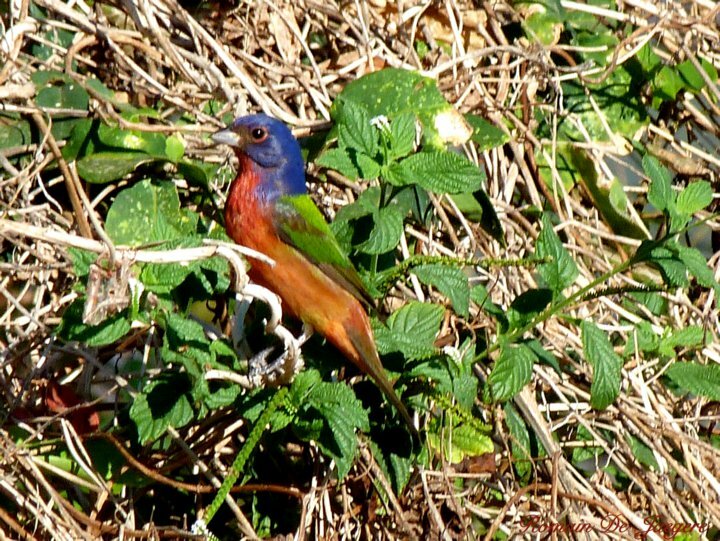 The male Painted Bunting (Passerina ciris) stands in dramatic contrast to the female, whose yellow-and-green coloration provides excellent camouflage as it feeds on grassy seeds in undergrowth in open areas. It breeds in the southern and eastern US and northern Mexico, and migrates our way as a winter resident. Intensification of agricultural practices in the southern US have reduced its habitat so much that it is now listed as Near Threatened on the Red List. 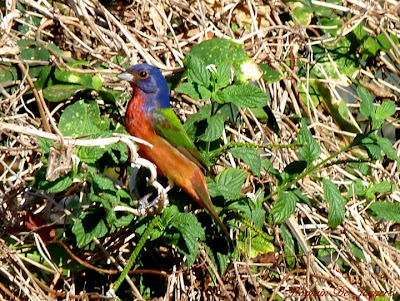 They are common enough in Laguna de Apoyo Nature Reserve that we have captured several in our bird monitoring program. This and several other birds here are on the Endangered Species list. 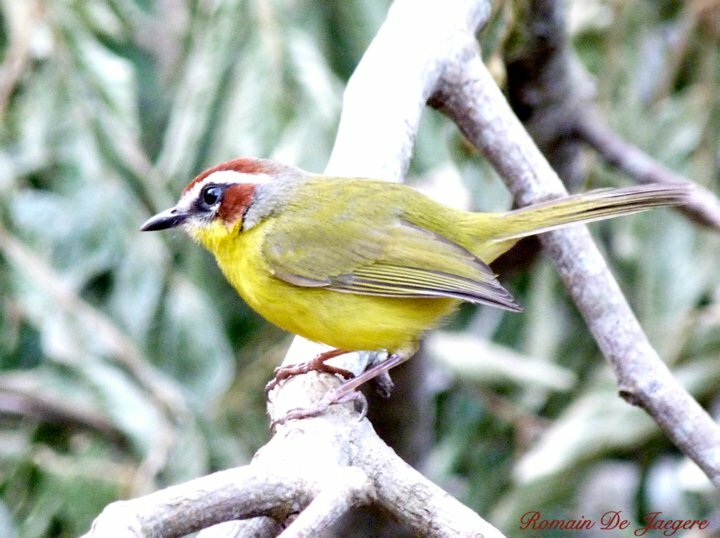 The Chestnut-capped Warbler (Basileuterus delattrii), considered by some to be a subspecies of Basileuterus rufifrons, is our only resident warbler in Laguna de Apoyo Nature Reserve. Unlike the migratory birds, its bill is relatively thick. A pair drinks from our water tank daily, and will land within ten meters of a quiet observer. These species all provide plenty of opportunities for nature photography. The birds here have something to offer to scientists and nature tourists alike. All the pictured birds are likely seen in a single day of birding in appropriate conditions. 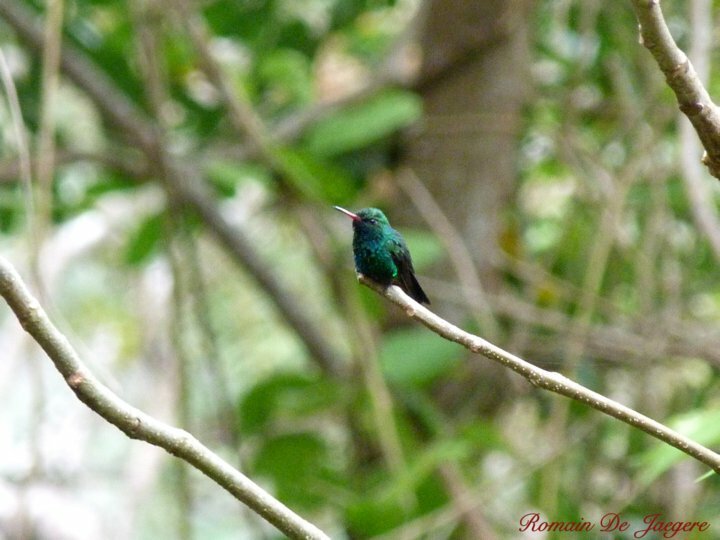 Estacion Biologica can provide a skilled guide to lead a nature walk to see these birds and more. ﻿A typical morning birdwatching excursion with our guides yields thirty or more species of birds.